Rustic posy's with hessian & flax grasses. Large brides posy in Ivory & soft coral with curled grass loops $190 NZD. 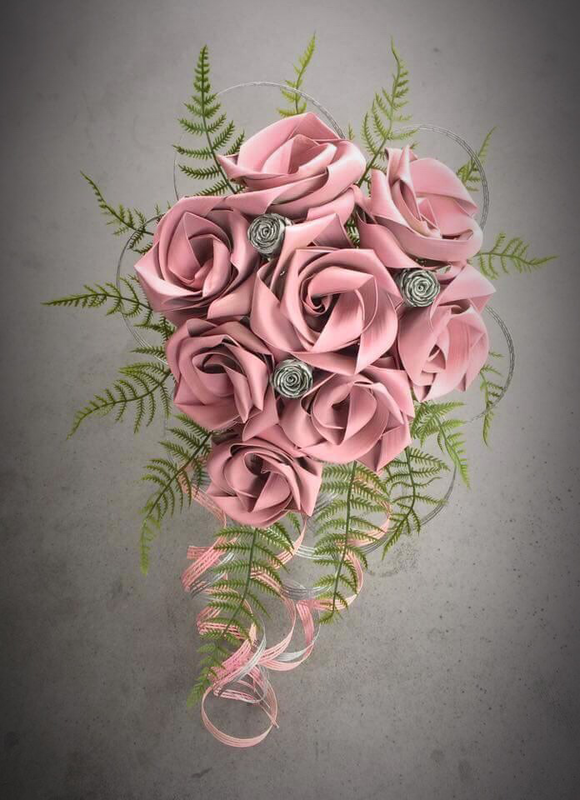 Bridesmaids posy's $90 NZD ea. 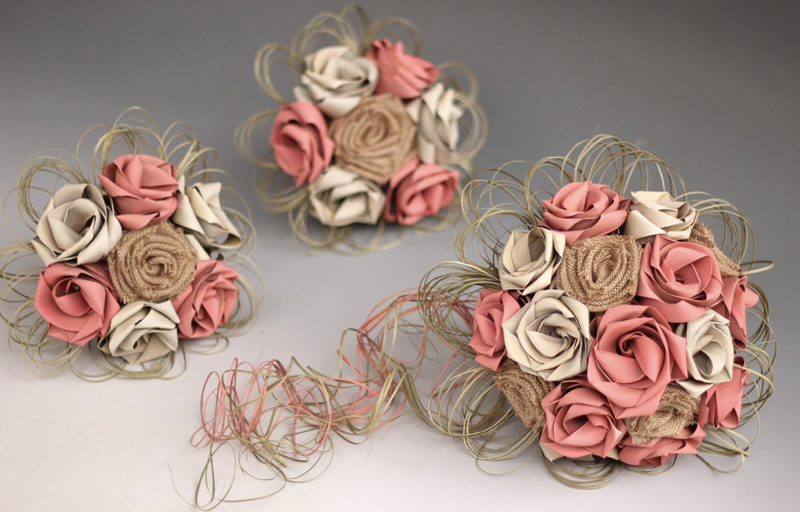 The Rustic hessian bouquets in bright coral & grey $190 NZD for the bridal posy & $90 NZD for the bridesmaids posy. 100% NZ Flax & can be dispatched worldwide. Stalk is Hessian wrapped for comfort. Very light to hold. Flax grasses cascade down the bridal gown. Matching rustic buttonholes $20 NZD each. Headband $30 NZD. 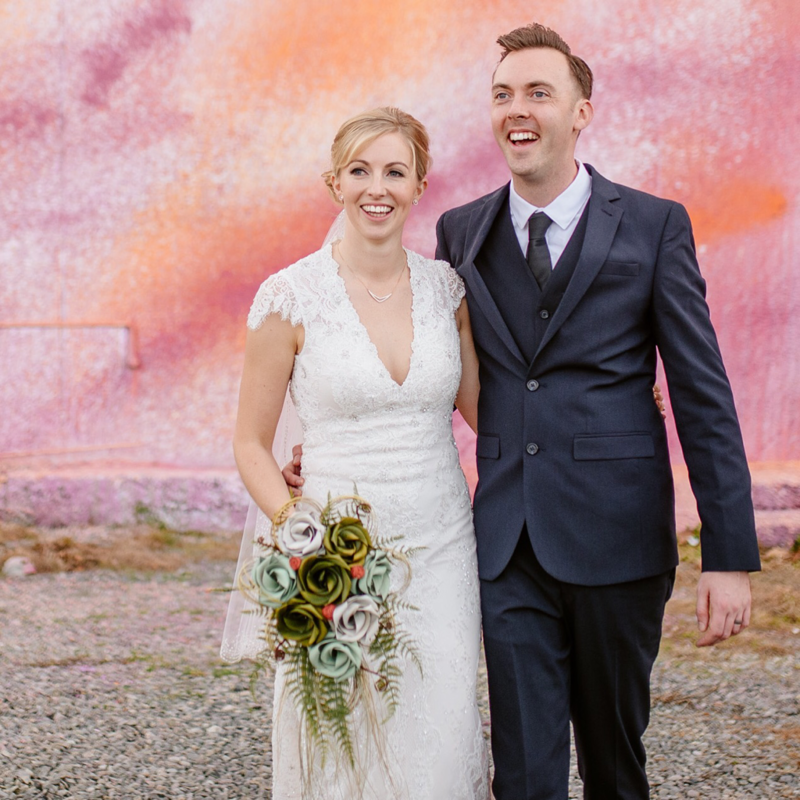 Bridal six flower waterfall bouquet in ivory & blush $180 NZD. Bridesmaids single teardrop posy $70 NZD each. 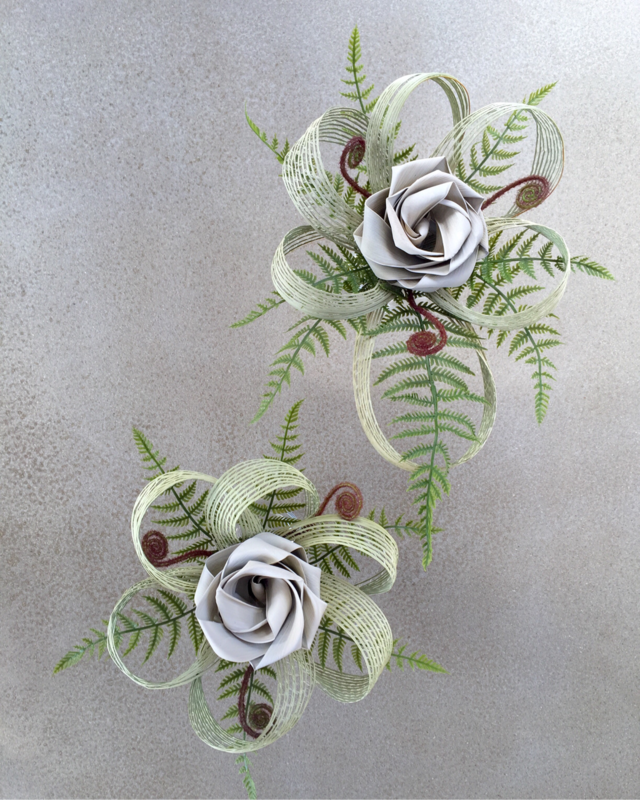 Ivory rose trio with large netted loops, green fern & koru with wide trailing loops $160 NZD. 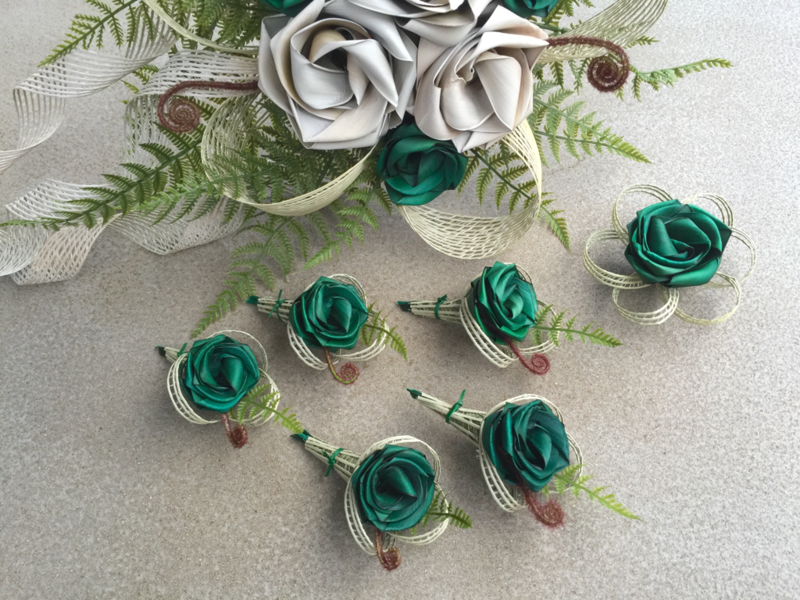 Bridesmaids single flower posy's in Ivory with wide loops, green fern & koru $70 NZD. Round posy & teardrop styles. 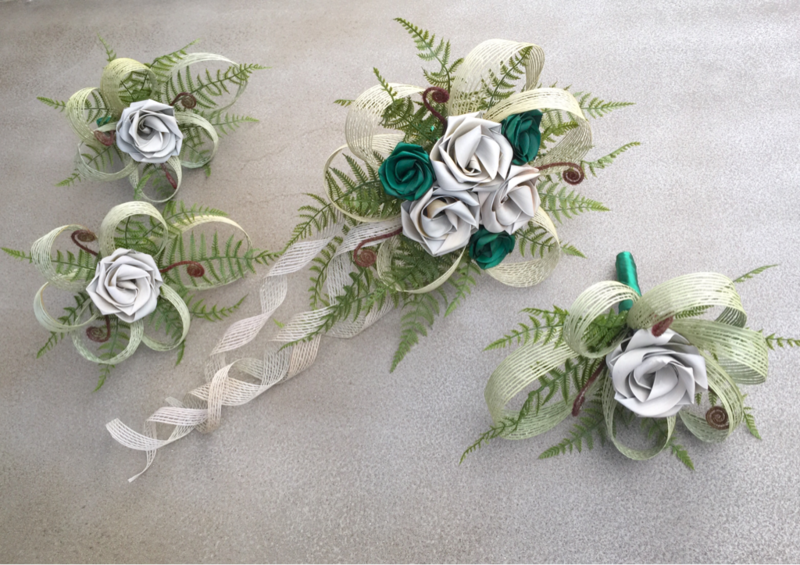 Ivory rose buttonholes with green fern & natural loops $20 NZD & Ivory wrist corsage with ferns & koru $35 NZD. Rustic Halo $40 NZD Rustic rose on a Bobbie pin $25 NZD each. 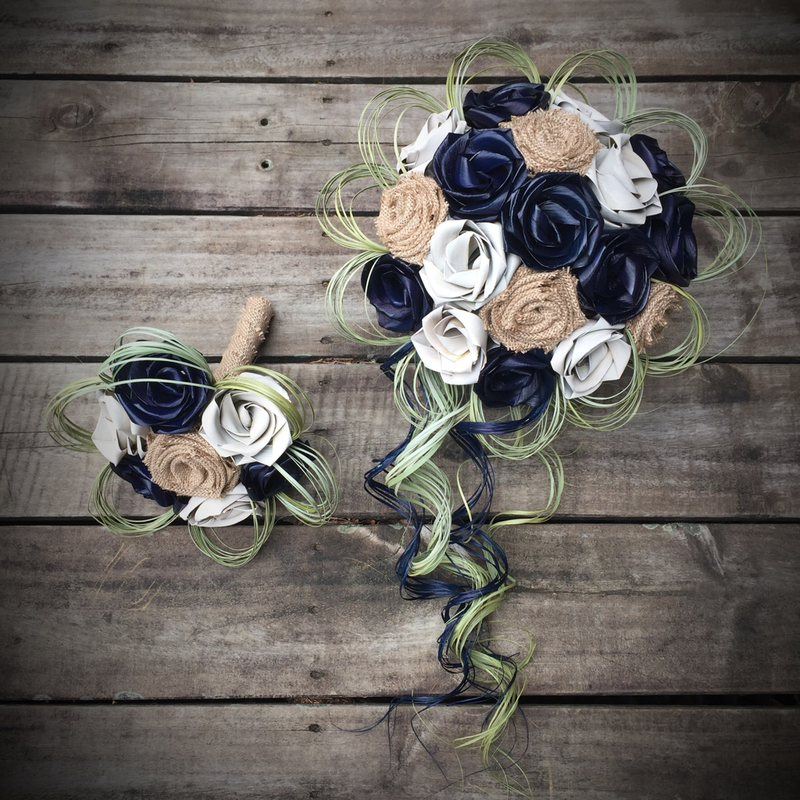 Large brides rustic bouquet in navy, Ivory & hessian with curled grasses $190 NZD. Matching bridesmaids posy $90 NZD. Brides orange teardrop bouquet with green fern, koru and natural grasses $190 NZD. 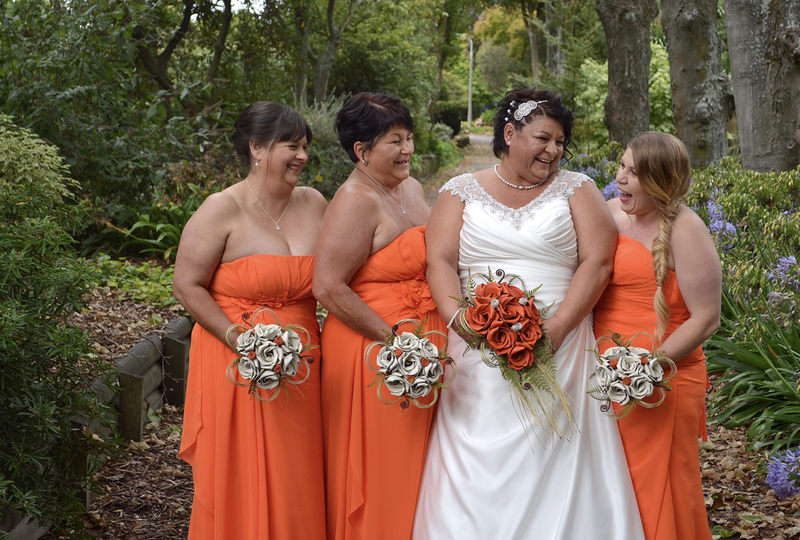 Bridesmaids ivory seven flower posy's with orange buds, ferns, koru & natural grasses $90 NZD each. 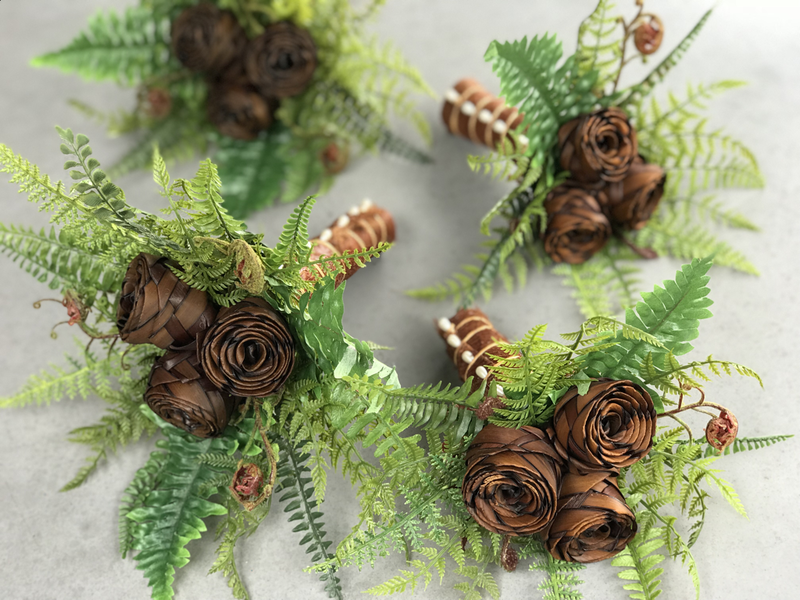 Rustic waterfall bouquet with straight grasses, green fern & koru $190 NZD. Bridesmaids posy's to match $90 NZD. Our happy couple looking fabulous. Koru ring pillow in hessian & woven flax rope $50 NZD. 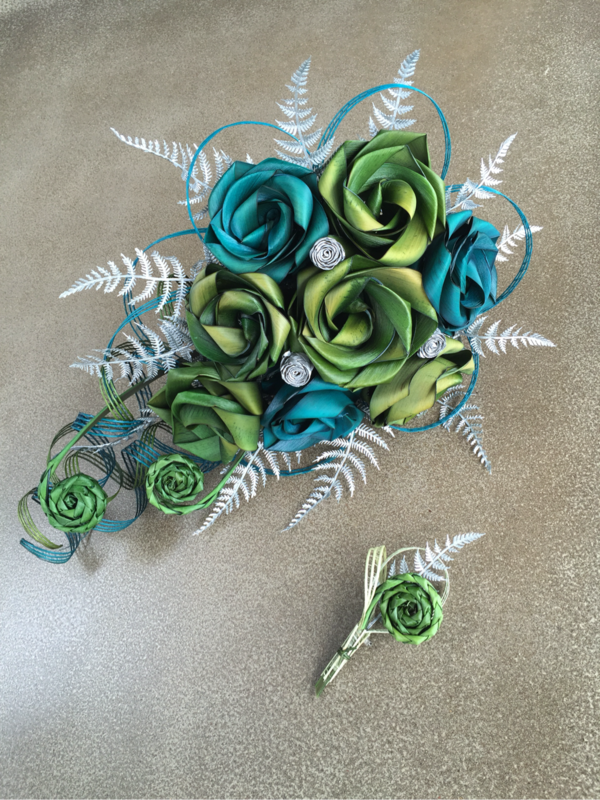 Waterfall bouquet in sage green & turquoise with two woven koru $190 NZD. Woven koru buttonhole $25 NZD. Six flower posy's to match $90 NZD. 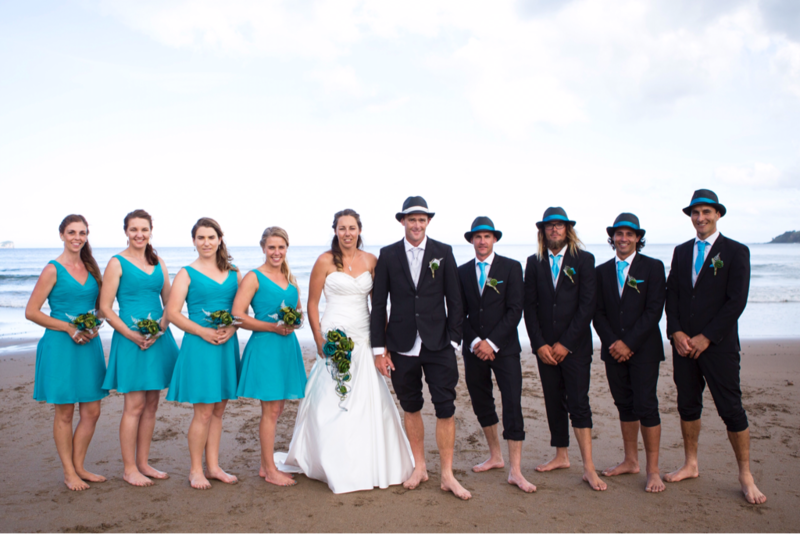 Our stunning bridal party on an amazing beach in Coromandle NZ. 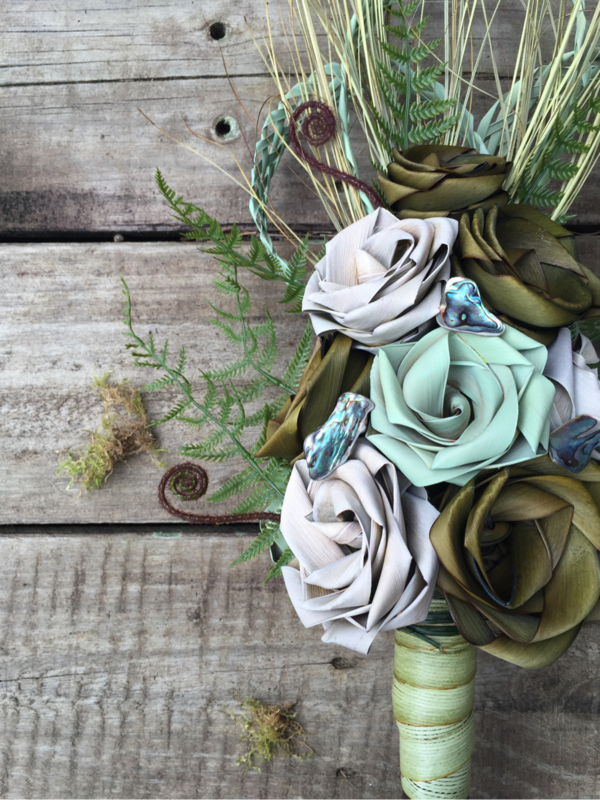 Natural cascading bouquet with grasses, woven loops, green fern, koru, Paua & flax flowers in sage, Ivory & pale sage $190 NZD. Close up image to show off our paua, koru & quality Imitation fern. 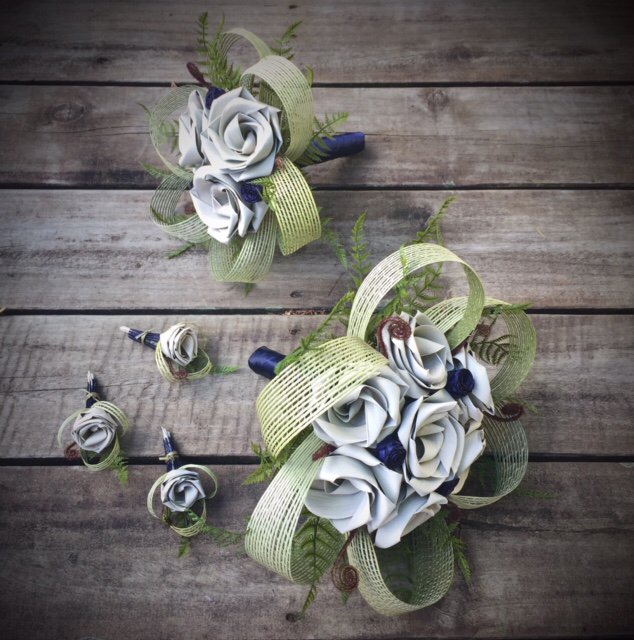 Brides round posy in ivory with x-large natural loops with navy buds and ribbon on the stalk. Extra green ferns & koru $180 NZD. Matching three flower bridesmaids posy $85 NZD. Matching buttonholes $20 NZD each. 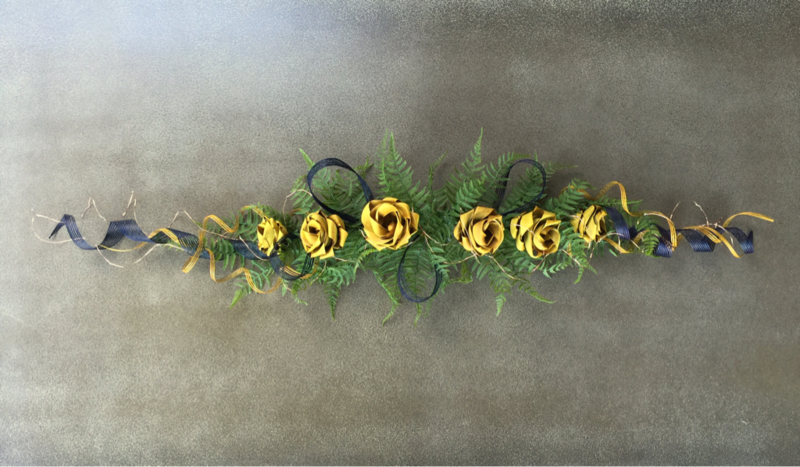 Bridal hair comb with one rose, two buds, wide loops, fern & koru $40 NZD. 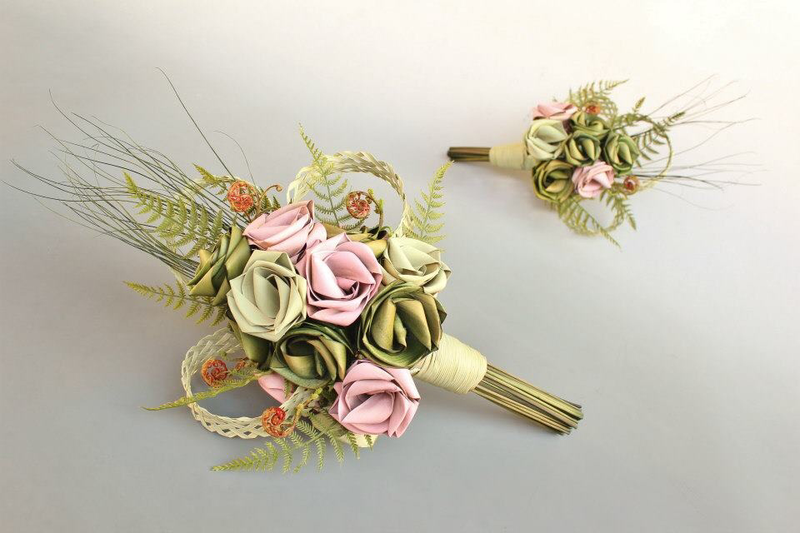 Waterfall bouquet in pale pink with green ferns & tiny silver details $190 NZD. 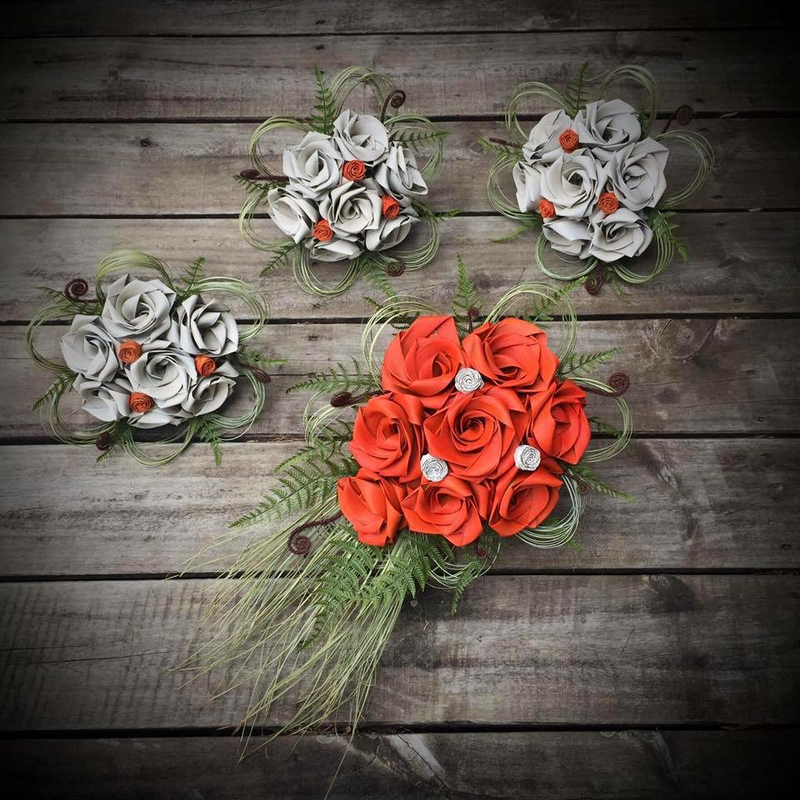 Rustic wrist corsages $30 NZD. 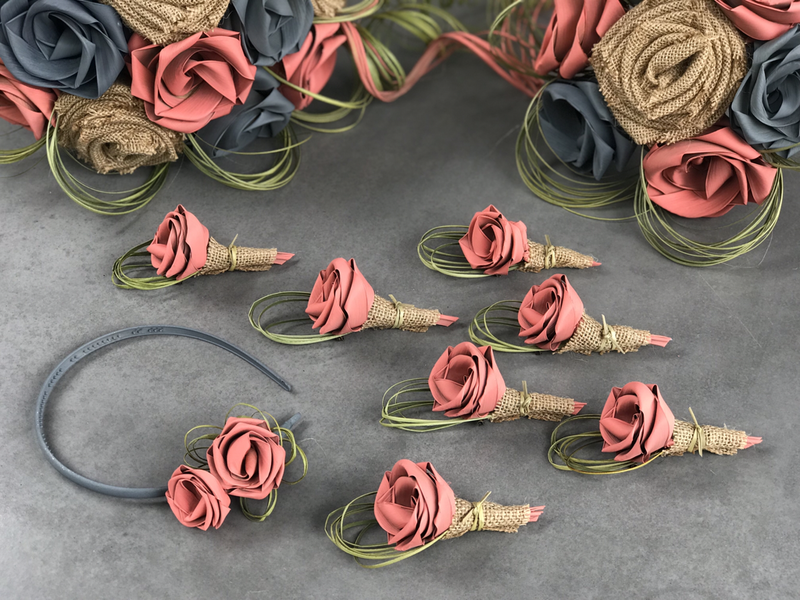 Rustic buttonholes with hessian wrapped stalks $20 NZD. Rustic single flower grass posy $70 NZD. Small rustic brides posy with grasses, tiny buds & netted loops with flax & hessian flowers $120 NZD. Native bud & fern posy’s. Bride $190 & bridesmaids three bud native fern posy $85 NZD each. Bridesmades native three bud fern posy with stalks wrapped in husk. 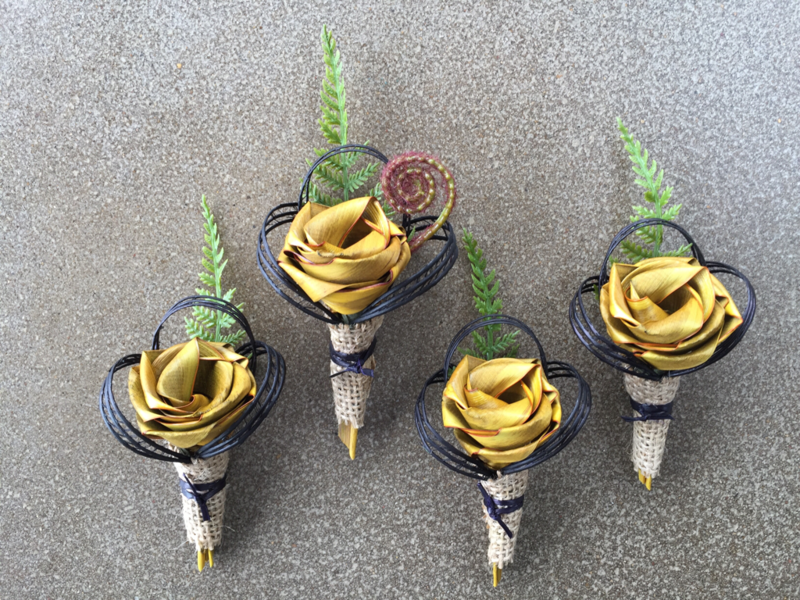 Native three bud bridesmaid bouquet with ferns & natural netted loops $85 NZD. 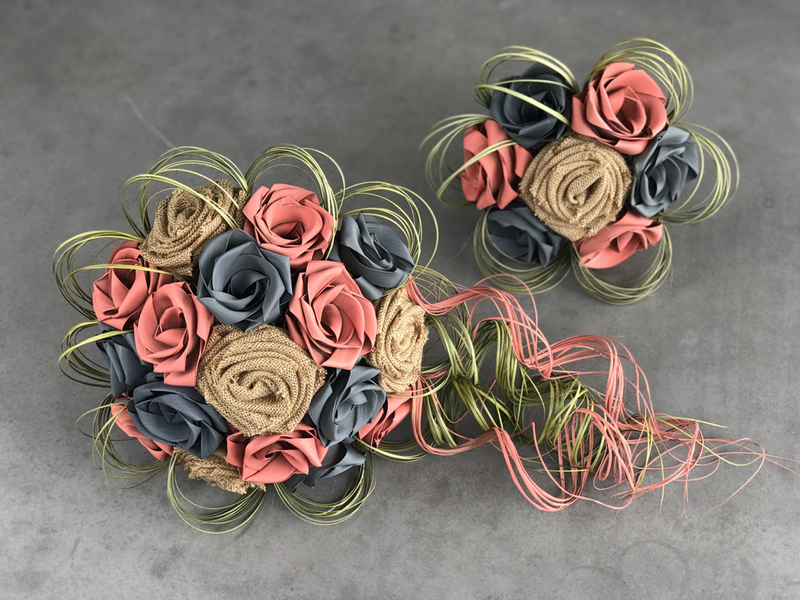 Bridesmaids rustic grass seven flower posy with a hessian centre flower $90 NZD. 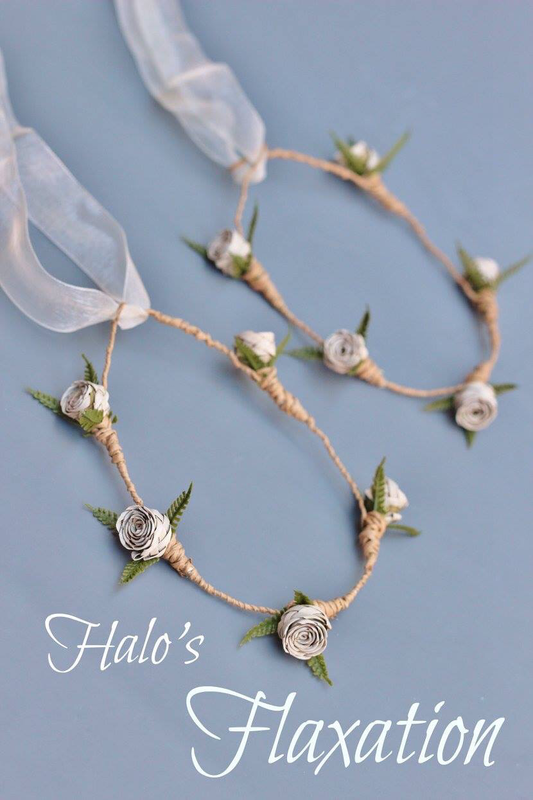 Matching rustic halo $40 NZD. 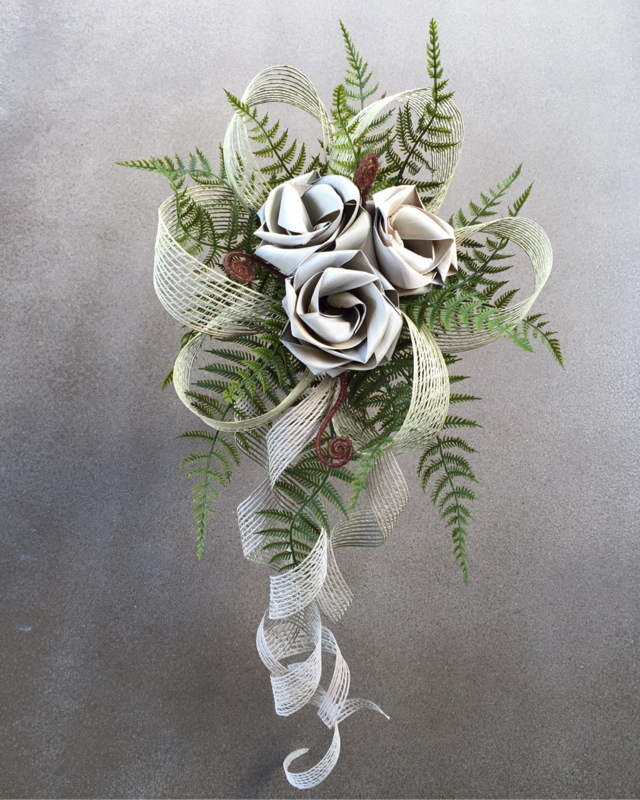 Large rustic brides posy with curled loops, hessian & flax flowers $190 NZD. 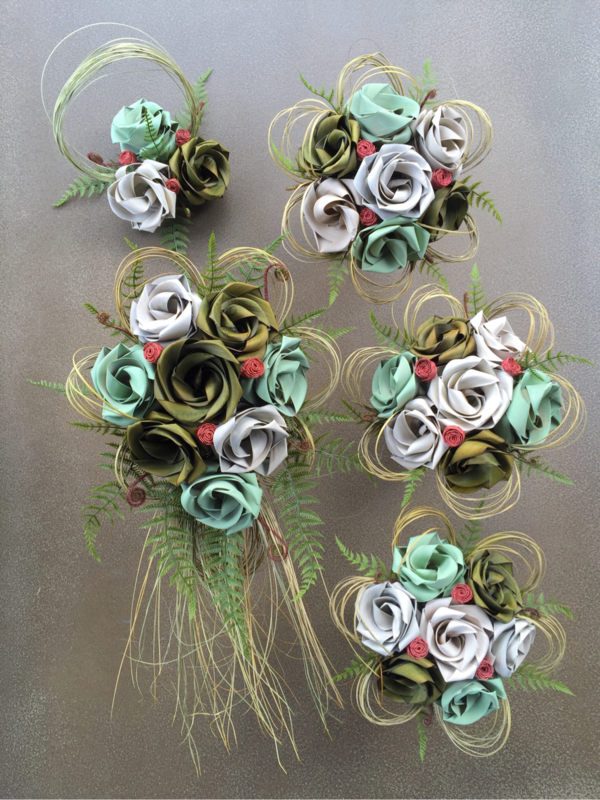 Cascading bouquets with natural fern, koru, grasses & woven loops. Bride $190 NZD & Bridesmaids $100 NZD. 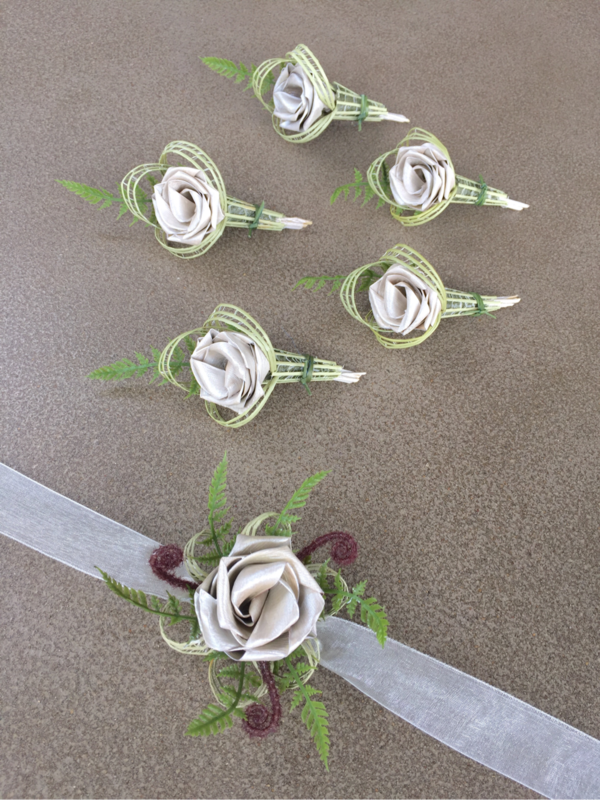 Ivory rustic buttonholes with natural loops and hessian wrap on the stalk $20 NZD each. 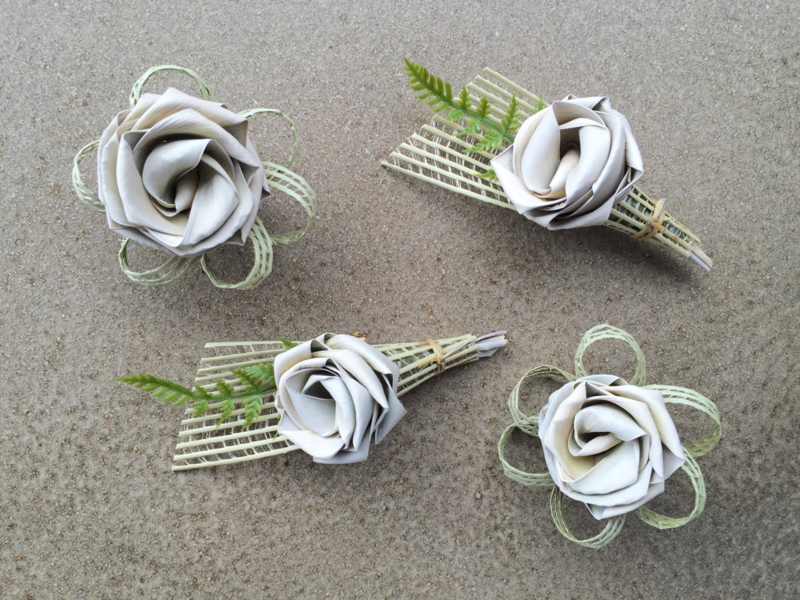 Lady's corsages Ivory rose with natural loops all around. 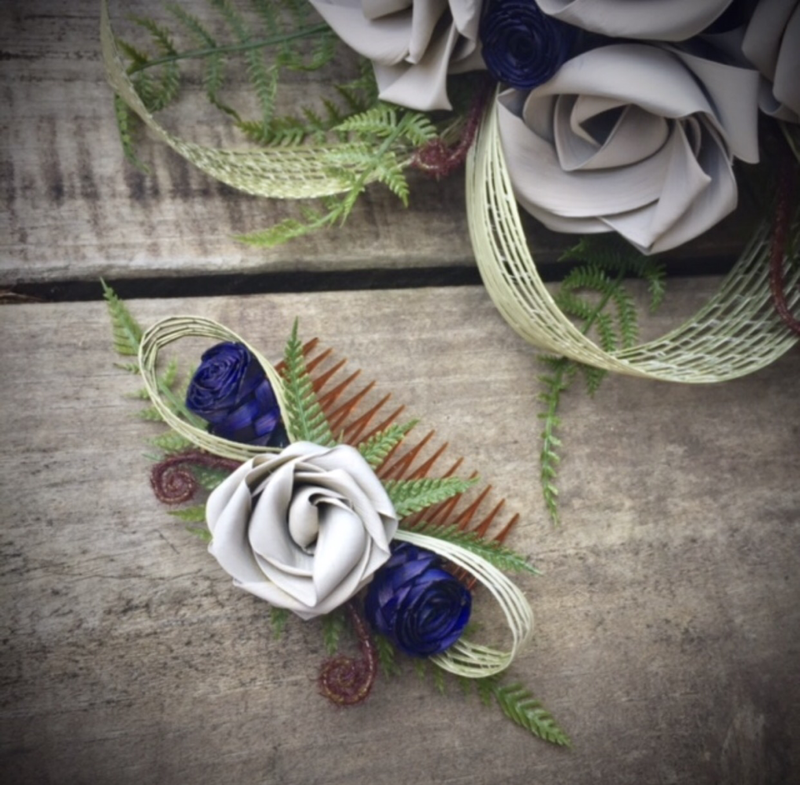 Mens buttonholes with Ivory flower, natural fan and green fern. $20 NZD each. 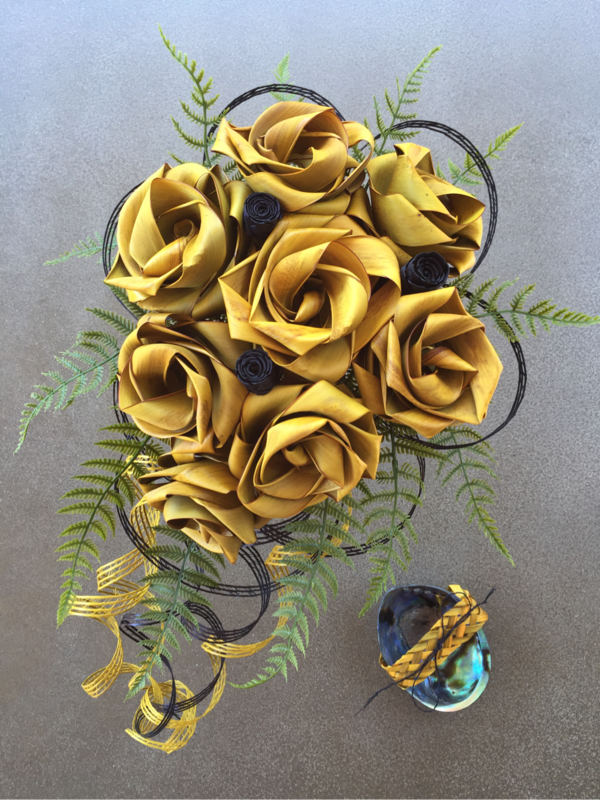 Brides waterfall bouquet in yellow with green fern and black buds $190 NZD. Paua shell ring holder $50 NZD. Bridesmaids seven flower posy's $90 NZD. Rustic hessian wrapped stalks. 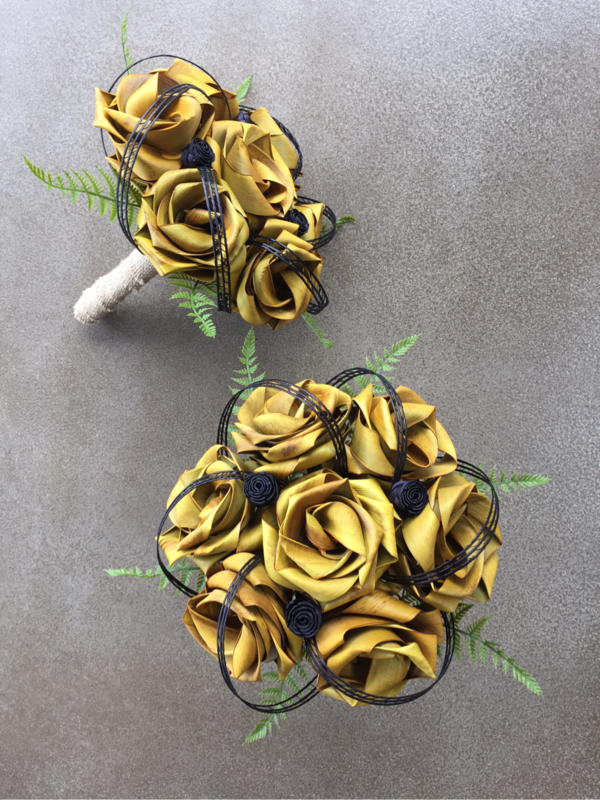 Yellow & black loop buttonholes with green fern and hessian wrap on the stalks $20 NZD each. 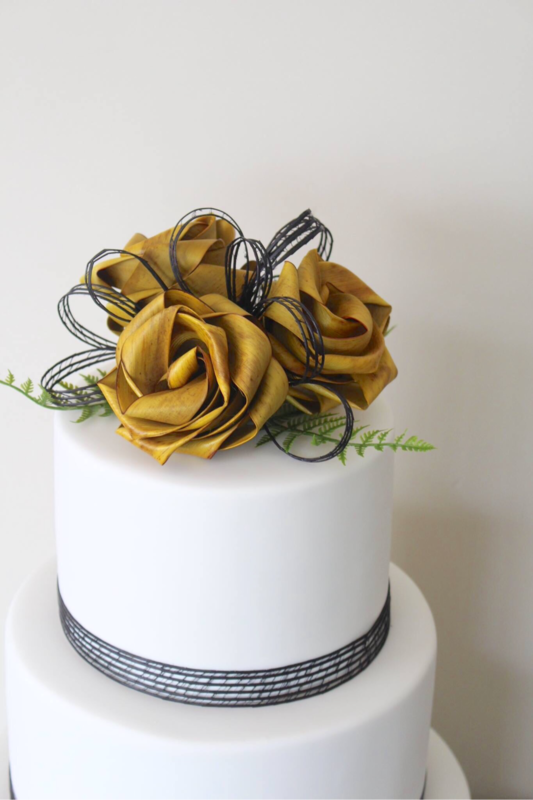 Three flower cake topper in yellow with low black loops and green fern $45 NZD. Black netted cake band are an extra cost depending on the tier size. Natural Aroha cake skewer $29 NZD. Long six flower table centrepiece $120 NZD. 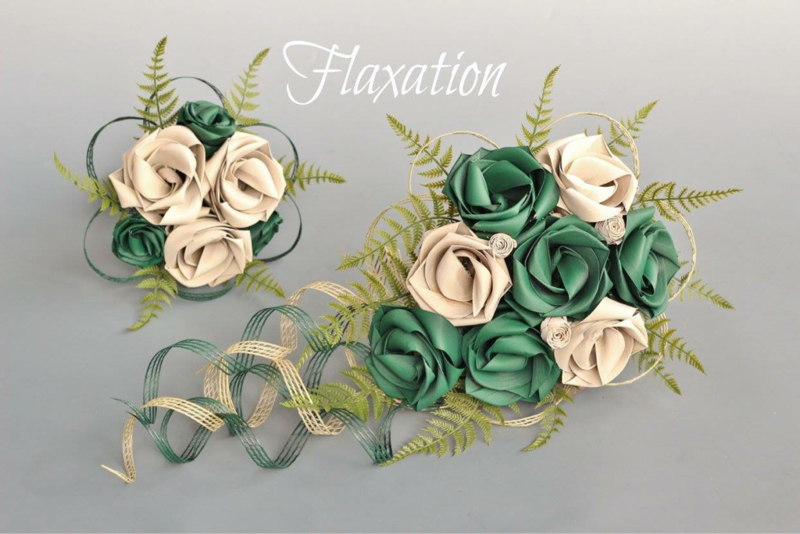 Brides six flower waterfall bouquet in Ivory & emerald with green ferns and koru $170. 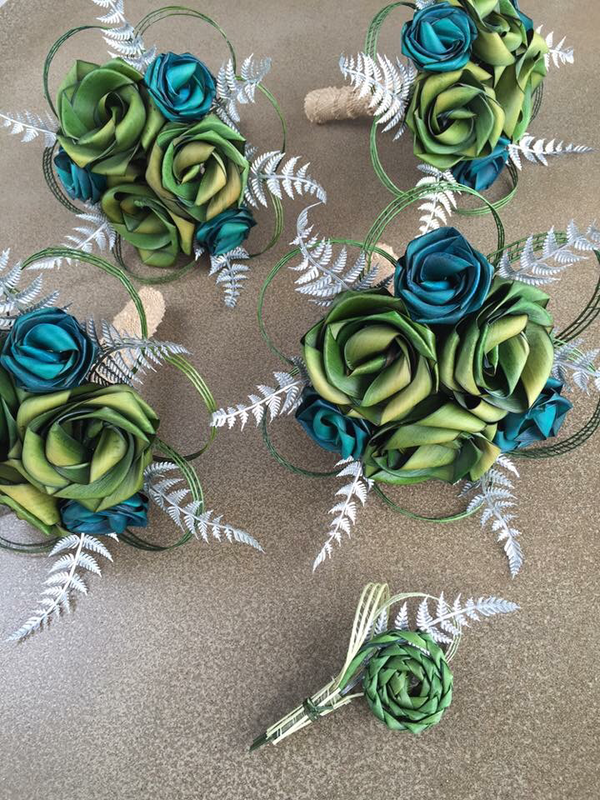 Bridesmaids single flower matching posy's with emerald wrapped stalks $70 NZD each. These look great against an emerald bridesmaids dress. Matching emerald loop buttonholes with fern & koru $20 NZD each. 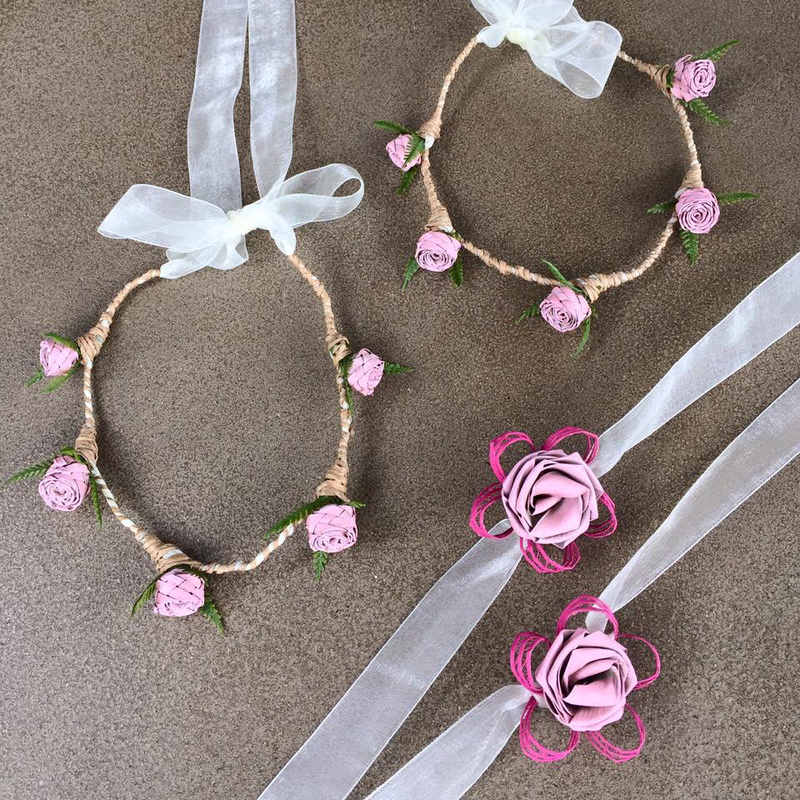 Flower girl halos $40 NZD each & wrist corsages $30 NZD each. 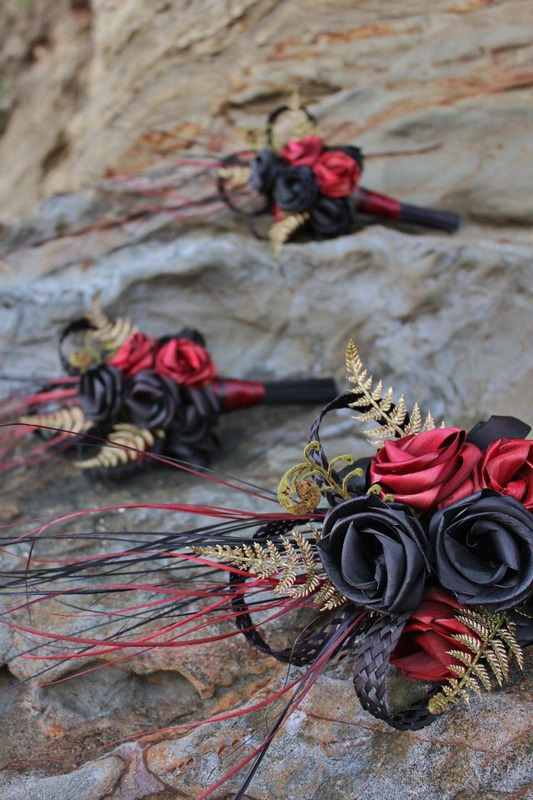 Cascading bouquets in red and black with grasses, ferns, koru and woven loops. 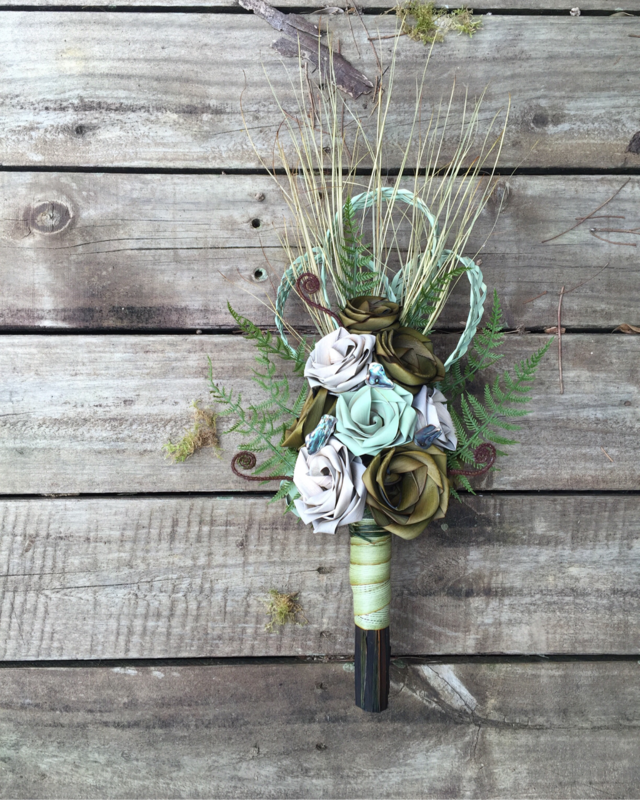 Large rustic bridal bouquet in sage, gold & hessian with curled grasses $190 NZD. 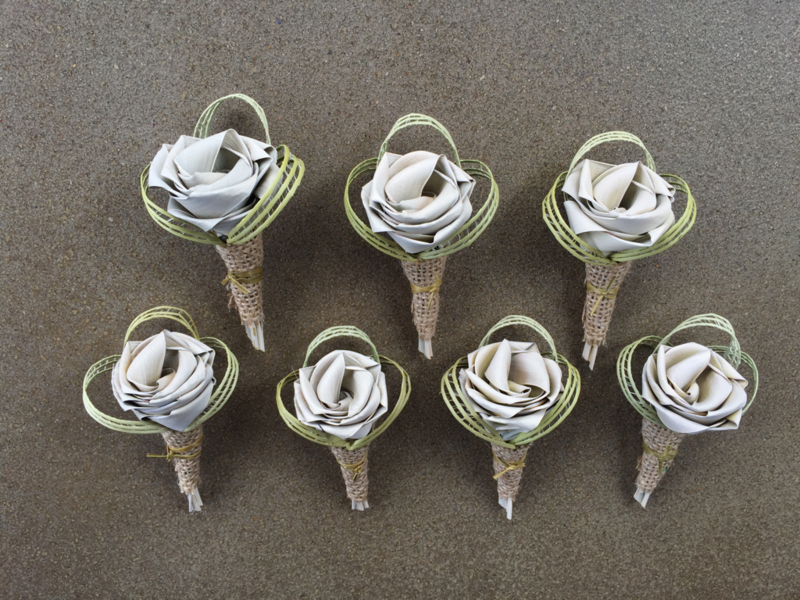 Bridesmaids rustic seven flower posy in sage & gold with hessian flower & grass loops $90 NZD. Woven horse shoe with rustic flower $50 NZD. 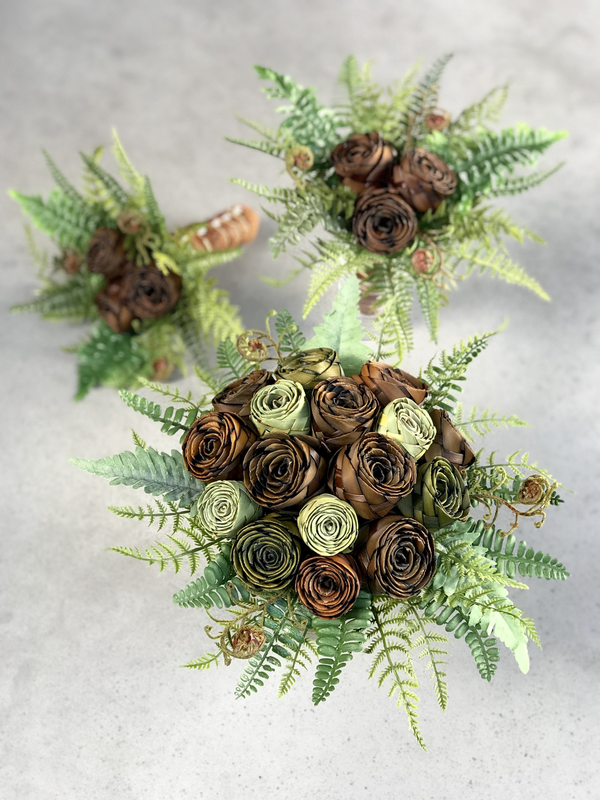 Brides waterfall bouquet in bottle green & Ivory with green fern $190 NZD & bridesmaids six flower bouquet in Ivory & bottle green with fern $90 NZD. Posy's in Ivory, Lilac & pale pink with gold loops.